A ballet center expansion, a restored Northside house and a redevelopment of a Shockoe Bottom warehouse building were among 10 local preservation and revitalization projects recognized with Golden Hammer Awards at a ceremony this month. 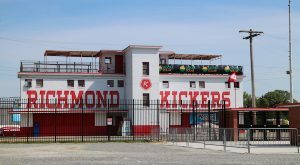 The annual awards, presented the past two years by Historic Richmond and Storefront for Community Design, recognize projects in categories that include adaptive reuse, new construction, placemaking, residential and restoration. Before-and-after shots of the 1717 Innovation Center. 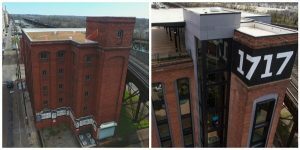 “Best adaptive reuse” awards went to Richmond Ballet for the rehab of the lower level of its building on East Canal Street and Capital One’s conversion of a century-old, six-story former tobacco warehouse in Shockoe Bottom into its 1717 Innovation Center. Richmond Ballet worked with local contractor Conquest Moncure & Dunn and architecture firm 3north on the rehab, which created two new dance studios, locker rooms and a costume storage area. Gilbane Building Co. and SMBW Architects were the builder and architect on 1717, respectively. 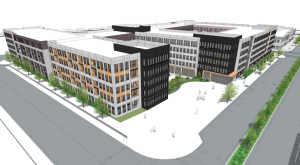 The 42,000-square-foot building houses startup incubator Startup Virginia. Hollyport Ventures’ Jefferson Green condos on the Union Hill bluff beside Jefferson Park was recognized in the “best new construction” category. 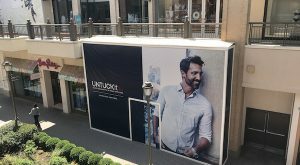 Hollyport’s Richard Cross designed the condos, which were constructed by Jay Epstein of Health-E-Community Enterprise of Virginia. Before-and-after shots of the Venable Street restorations. 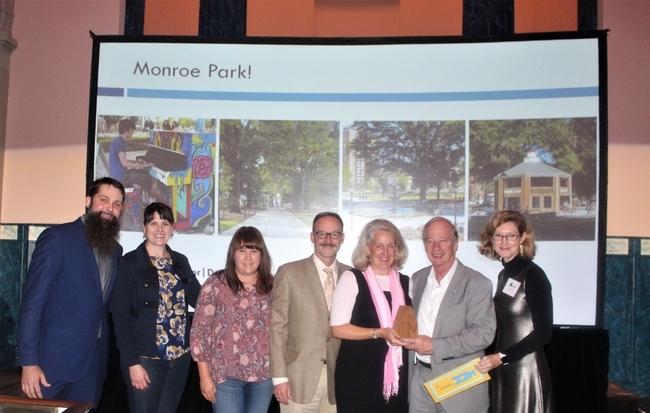 “Best placemaking” went to the City of Richmond’s $7 million Monroe Park renovation, a two-year effort spearheaded by the Monroe Park Conservancy with support from VCU. 3north was the landscape architect on the project. The university also received recognition in the placemaking category for its $41 million Institute for Contemporary Art at VCU, designed by New York-based Steven Holl Architects in collaboration with Richmond-based BCWH Architects, which recently was absorbed by Quinn Evans Architects. 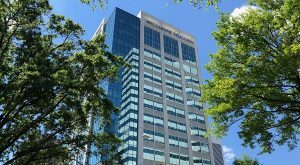 Gilbane Building Co. was the contractor on the project. “Best residential” awards recognized a home renovation at 125 N. 25th St. in Church Hill and Project:Homes’ restoration of two houses at 2013 and 2015 Venable St. Todd and Neely Dykshorn worked with design firm Architecture Design Office, and contractors Kiwi Development and Greenleaf Builders, on the 25th Street house, while Project:Homes worked with architect David Winn. A tree fell on Holly Lawn in 2016. 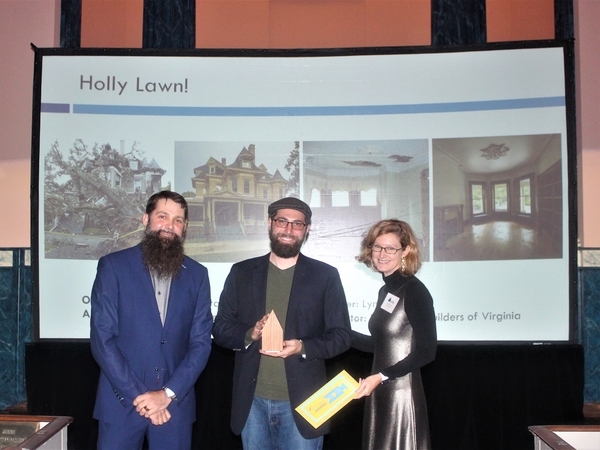 “Best restoration” awards went to three projects: Holly Lawn, the Queen Anne-style house on Hermitage Road that was damaged by a felled tree in 2016; the City of Richmond’s Main Street Station train shed; and Ellwood Thompson’s owner Rick Hood’s restoration of the round midcentury medical office building at 3539 Floyd Ave.
Holly Lawn owners Frank Rizzo and Leslie Stack worked with Glavé & Holmes Architecture and Restoration Builders of Virginia. The train shed restoration involved contractor Taylor & Parrish, lead architect SMBW and preservation architect Beyer Blinder Belle. Hood worked with Walter Parks Architects on the round building restoration, which also involved Sadler & Whitehead Architects and J.A. Heisler Contracting. Thomas Flanagan receives the Restoration Builders of Virginia’s award. Thirty-five submissions were received for projects completed after Jan. 1, 2017. The awards ceremony was held Nov. 1 at Monumental Church. Judges included Kim Chen with the City of Richmond Planning and Preservation Division, City Councilwoman Kim Gray, Better Housing Coalition CEO Greta Harris, Modern Richmond Realtor co-founder Andrea Levine, Church Hill People’s News founder John Murden, Baskervill principal Burt Pinnock, Camden Whitehead of VCU Interior Design and Sadler & Whitehead, Historic Richmond Executive Director Cyane Crump, and Storefront for Community Design Executive Director Ryan Rinn. The Main Street Station’s train shed was updated with glass walls and a new roof.